For my one year blog anniversary, I invited you to nominate people you’ve met through the blogging world whom you would like to have as next-door neighbors . . . and to tell why. It was SO heartwarming to read the lovely comments that came in from all around the world! The blogger with the MOST nominations was then invited to send me a once-loved garment to remake into some fun treasures (a-la “What can you make with a flannel shirt?,” “What can you make with a lace tank?,” and “What can you make with a polo shirt?“) and return. The winner was Kelly of Cobwebs, Cupcakes & Crayons! Kelly said, “After the shock wore off I ran to my closet to decide what I was going to send. I chose a little sundress that has a lot of happy memories attached to it, but now that I’m a mama seems a little, well…SHORT. I know that I will never wear it again, so I am very excited to send it off!” So . . .today is the big reveal! In addition, this project will have a permanent home on the “What Can You Make With A . . .” page on my header. The zippered back of the sundress was perfect for the back of a pillow cover, and I added the pretty label and butterfly that I snipped from the inside neckline. 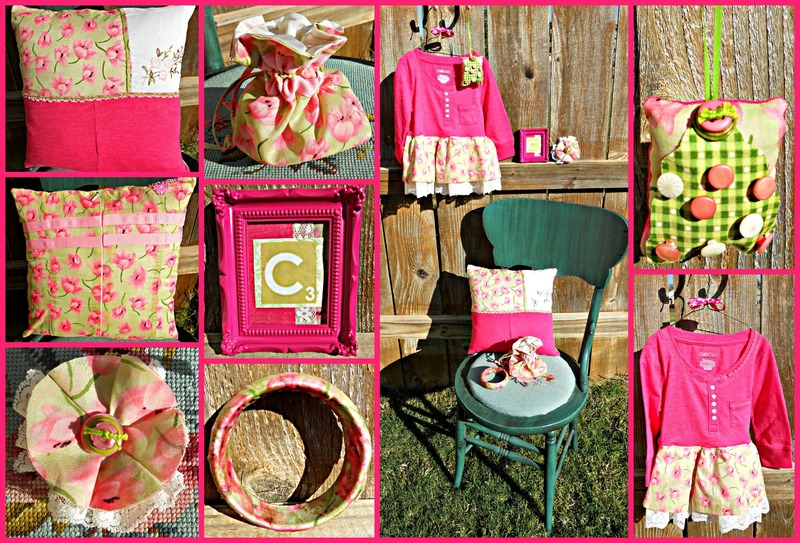 The pillow front is a combination of dress fabric, T-shirt fabric, a vintage hanky, pale pink lace, and lime-green embroidery. The bodice of the sundress is now a jewelry pouch! The ribbons form the casings, and the dress straps are the strings. The lining of the pouch is made from the dress lining for a soft, shiny finish. With seven circles of fabric, three stacked buttons, and a bit more of the lace from the bottom of the sundress, I made a fabric flower to pin onto a jacket, hat, or headband. A small rectangle of dress fabric and T-shirt fabric along with a bit of green dotted fabric and some buttons and ribbon were just the right ingredients for a Christmas mini-pillow ornament. Wow! You’ve got skills, woman! This is so impressive; your creativity clearly knows no bounds. My goodness, I had no idea you would come up with so many lovely things. Amazing! WOW! I can’t believe you did all of this in such a short amount of time! You’re amazing! So many wonderful things from a sundress. You amaze me!!! Wow! What a bunch of great ideas!!! That is AWESOME! It’s so neat to see all the things you can make with ONE garment! Very impressive! Congratulations on one year of Blogging, that’s fantastic Katherine. I can’t even imagine how you got all of that out of one little sundress, Bravo. You know something? You are amazing!!!! Wow! So many amazing items from one dress! amazing! These are so incredible!! What a wonderful package that Kelly will be receiving! Wow! How thoughtful and creative you are!!! You are amazing! I can’t believe you found so many ways to re-use one little dress. You are so very talented, sure wish it could rub off on me. Put me in front of a sewing machine and I will find a way to either make a mess of the fabric or break the machine. This was such a nice thing for you to do for Kelly and her daughter. I love, love, love this idea! wonderful job and what makes it even better was the very obvious joy and love that went into the project. So inspiring! 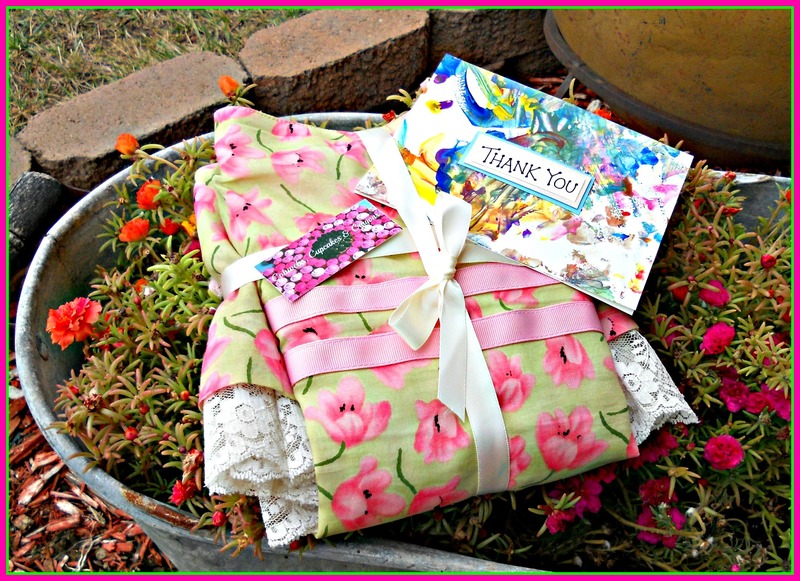 I love to reuse old clothing or other fabrics to create new treasures!! And your ideas are so great!!! I love, love, love what you’ve done. Kelly is one lucky lady. You’ve done remarkable things with just one dress. I’m going to pin this to my Pinterest “repurposed” board. Lots of great ideas. When I was a very young girl, and just learning to sew, I remember taking an old sock and making a dress, a hat and some shoes for my doll. It certainly wasn’t as artfully done as this, but your post brought it all back. I can see the love in every piece and I know you’re having fun. I’m glad we all get to share in that joy. Seriously?? I think this is the greatest, and I mean greatest thing ever. How will you ever top this? Your talent is amazing. Unbelievable, clever you!!! I never would have thought so many things could be made from the one garment. This is simply amazing! I can’t believe you came up with so many wonderful ideas from a simple little summer dress. Very inspiring! I love the pillows, of course! Amazing how many ideas can be generated by one sundress! I love all your ideas! Wow, you are amazing. That is SOME recycling! What brilliant inspiration.